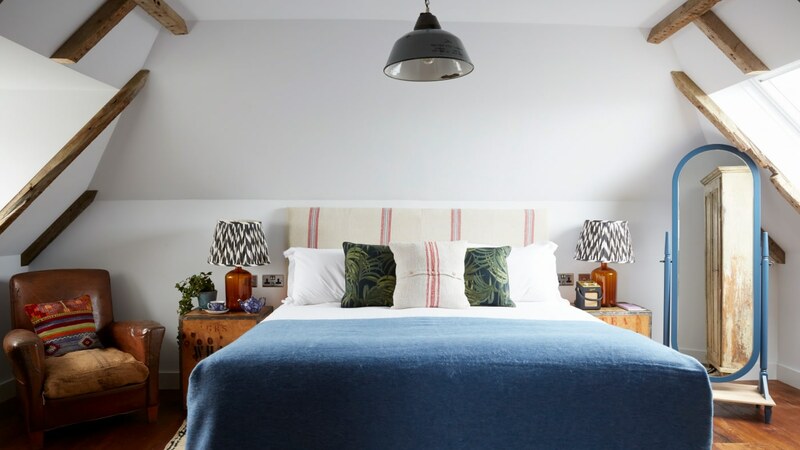 Cool, quirky and creative, the inimitable Artist Residence hotel collection offers artist-designed rooms and high-end dining at its four - soon to be five - locations around the UK. The fun and unique design-led interior brings together reclaimed vintage furniture, work from up-and-coming artists and features original skinflint lighting in a variety of settings across its London, Brighton, Oxfordshire and Penzance locations. A pair of reclaimed 1950s US traffic lights illuminate the counter of the Cambridge Street Kitchen restaurant in London, while polished aluminium machinist lights salvaged from a factory in the former Czechoslovakia provide lighting above the banquette seating in the dining area. A selection of lighting has been used throughout the hotel interior: racing-green machinist lights by British manufacturer Revo make characterful bedside reading lights, and a 1930’s R.A.F. hanger pendant provides statement ambient lighting above an armchair. In Penzance, blue enamelled Hungarian pendants hang in bedroom and living areas, while a variety of vintage Czech glassware has also been converted for use in the bathrooms. In Oxfordshire, naval passageway lights salvaged from a decommissioned Japanese cargo ship in India have also been converted for bathroom use. skinflint has been working with Artist Residence for a number of years and - we’ll admit - from its grassroots beginnings to today, it’s a relationship we’re rather proud of. Read more in our Q&A with Artist Residence founder and ‘accidental hotelier’ Justin Salisbury on the blog.